There are at least two times where we can readily observe muscle mass increasing along with muscle size. This post is only considering one person whose muscle size grows, and how that correlates with strength. The comments don’t apply to two people. For example, it is not assumed that if John gains muscle mass, and Mark does not, then John will be stronger than Mark. A correlation between muscle size and strength is seen among regular exercisers, especially male exercisers. Resistance exercise can cause an increase in muscle mass. So can aerobic exercise and walking. 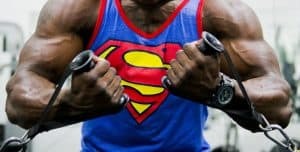 In another post, I described the different ways to lift weights, for different effects. One of the effects is increased muscle mass. An individual that lifts intending to make his muscles grow measurably, and who achieves that growth, will almost certainly lift more weight. There are different explanations for why this is so. Reasons notwithstanding, when weight lifting causes muscle mass to grow significantly, a person will lift bigger weights. If a guy is bench pressing 135 pounds, and that exercise made his muscles grow measurably bigger, they would give him the ability to bench press more than 135 pounds. There are limits. The muscle won’t continue to grow without end, and strength will not improve without end. At least once during life, weight gain will lead to an increase in muscle size and strength. This is easily seen in childhood. 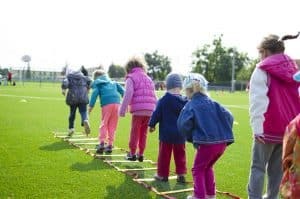 As kids age and get heavier, their muscles grow, and they get stronger. A child grows steadily bigger and stronger as she goes from 2 years-old to 5 to 7 to 9, etc. That’s not to say that all bodyweight gain leads to bigger muscles. Adults gain weight during pregnancy, inactivity, and a number of other reasons. Pregnant women who don’t exercise will gain weight without adding muscle mass. A sedentary person who gains weight primarily through body fat, will not increase his muscle mass (although there is some muscle in body fat), and will not likely grow stronger. ← What’s the best variation of the deadlift?